The 90-day ban on visitors from Iran, Libya, Somalia, Sudan, Syria and Yemen, and a 120-day ban on refugees has come into force. US PRESIDENT DONALD Trump’s ban on refugees and travelers from six mainly Muslim countries went into effect late last night, after a Supreme Court decision allowed it to go forward following a five-month battle with rights groups. But activists said the government has defined that too narrowly, excluding relationships with grandparents and grandchildren, aunts and uncles and others. And many were concerned about a possibly chaotic rollout of enforcement of the ban, like that in January when it was first announced. Immigration rights activists and lawyers were waiting to help arrivals at New York’s John F. Kennedy International Airport and other airports to be sure those from the six countries with valid US visas were allowed in after the ban went into effect at midnight last night. 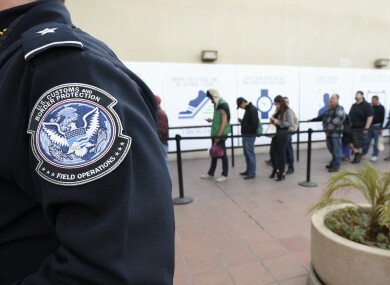 The Department of Homeland Security, which was heavily criticised for mishandling many arrivals when the ban was first attempted in January, promised a smooth rollout this time. It stressed that anyone with a valid visa issued before the ban begins would still be admitted, and that all authorised refugees booked for travel before July 6 will also be allowed. The Trump administration insists the ban was necessary to protect the country from terror threats, and to give immigration authorities more time to tighten vetting of travelers and refugees. “As recent events have shown, we are living in a very dangerous time, and the US government needs every available tool to prevent terrorists from entering the country and committing acts of bloodshed and violence,” a senior administration official told reporters. But implementing it, even with exceptions, was also claimed as a political victory by Trump, after federal appeals courts twice blocked his order saying it violated constitutional protections of religion and overshot his own presidential powers. Immigrant rights groups and Democrats in Congress continued to label Trump’s order “illegal” and said the exemptions provided in a Supreme Court ruling on Monday remained unfair. According to guidelines issued by the State Department, people with “close family relationships” would be exempt from the ban. It defined that to include parents, spouses, children, sons- and daughters-in-law, siblings and step- and half-siblings. But “close family” does not include grandparents, grandchildren, aunts, uncles, nieces, nephews, cousins, brothers-in-laws and sisters-in-law, fiances and any other “extended” family members, the guidelines say. People with formal relationships with a US entity — who have for instance been offered a job or been accepted to study or lecture at a university — will also qualify for visas during the ban. But a hotel reservation, even if already paid for, does not qualify. Email “White House says travel ban will prevent 'acts of bloodshed and violence'”. Feedback on “White House says travel ban will prevent 'acts of bloodshed and violence'”.